Looking for the ski experience of a lifetime? Grab your fat skis and head to the 49th state, where helicopters whisk you to the insane terrain of untouched powder, towering ranges, steep vertical drops and ultra-long descents. This is the land where legend comes to life. Alaska’s Chugach range is home to a number of high-caliber heli-ski operations. Each offers access to thousands of glaciated acres—so much territory, in fact, that you can go for a week and never ski the same line twice. If you’re a solid intermediate downhill skier, comfortable on red runs, then heli-skiing is within your reach. Alaska offers a stunning variety of terrain, from colossally steep drops to easier runs pitched on par with those in ski resorts. Keep in mind that the powder you’ll find in Alaska requires different skills than the hard-pack at your local hill. Some operators, like Pure Powder, offer introductory courses for newbies. No matter your experience level, be in ski shape before you land in Alaska and you’ll have much more fun. The heli-skiing season in Alaska runs about 12 weeks, starting in February and lasting into April or early May. The early season beckons with crisp days, dry powder and the best overall chance of glimpsing the Northern Lights. The days probably won’t be as cold as you imagine: February temps range from 20 to 40 degrees Fahrenheit. April brings long sunny days that seem to go on forever, with variable snow conditions as the sun and shadows duke it out on the mountain flanks. When resorts in the lower 48 states wrap up their seasons, an influx of diehard skiers make for Alaska, turning the late season into an elite stomping ground. Whether you choose a bare-bones operator (buy your own groceries) or the deluxe model (airport pickup and hot chocolate in the heli), your day of heli-skiing will share some common ground. Assuming it’s a clear day, you’ll wake to the sound of helicopters warming up. Safety lessons were covered the night before. Armed with safety gear, dressed in layers and probably feeling nervous, you’ll board a helicopter and head for your first peak. A guide accompanies each group of skiers, leading the way down one at a time for safety’s sake. Flying down the run (typically 3,000 – 4,000 vertical feet), a plume of powder sprays behind you and a smile engulfs your face. The day may hold 8-10 runs total, with a total of 20,000 – 30,000 vertical feet. At the end of each run, the helicopter will whisk you to the next amazing run, leap-frogging from peak to peak in the jaw-dropping Alaskan playground. How many helicopters does the operation have? Mechanical breakdowns and refueling breaks can interfere with a beautiful ski day. Is there a backup in place? How many groups will ride in each heli? How does the operator charge for heli-time? Make sure you understand the policies before you sign on the dotted line. What safety standards and equipment are in place? In the glaciated terrain of the Chugach Range, avalanche danger always lurks. How much time should you expect to spend in the heli over the course of a day? What options are in place for days when poor conditions prevent heli takeoffs? What’s the policy for tipping? Will the operator provide photos or video of your ski adventures? 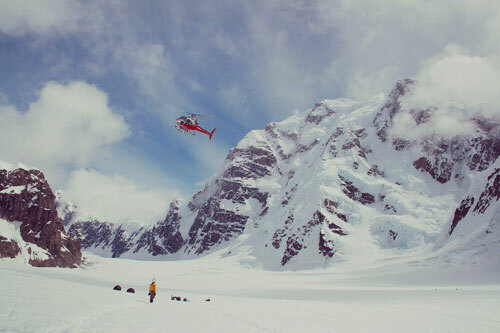 We can’t count the number of times visitors have described heli-skiing in Alaska as the best vacation of their lives. Whether you’re an intermediate resort skier or a Bode Miller wannabe, you can’t go wrong with Alaska’s pristine snow, stunning landscapes and big, iconic lines. Now’s your chance to book an unforgettable vacation.